Whenever an automatic sync is run on your farm, Figured does a series of checks. In some instances, we may detect that your farm has orphaned transactions. Orphaned transactions affects sales and purchases account that are mapped to a production tracker. It means there's a financial transaction that exists without a related production tracker transaction. For example, if you have an account called Chemicals that you budget against in the planning tab - these are purely financial transactions you're creating. On the other hand, if you have a dairy cattle tracker and you've mapped the account Dairy cattle - Sales, and you create a transaction - this transaction has both a financial aspect as well as a production tracker transaction. 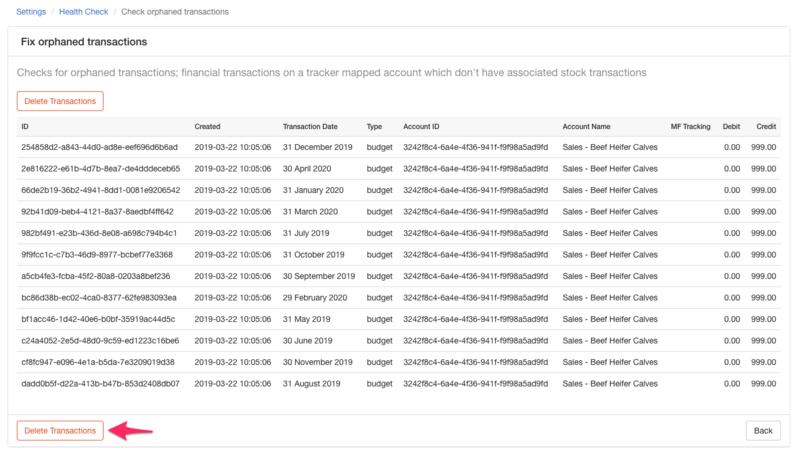 Orphaned transactions generally happen when you have budgeted against an account in the planning tab, and then mapped the account to your production tracker. You will be prompted to delete these orphaned transactions to fix the error. To resolve this, click fix this problem and on the following page press delete transactions.